The Anzisha Prize is thrilled to announce this year’s winner of the $25,000 Grand Prize in the 5th year of Africa’s premier award for youth entrepreneurship. Chris Kwekowe (22), founder of Slatecube which offers a job-relevant skills learning platform and job placement services, impressed the judges. Slatecube has had significant success to date with potential for scale and will serve as an inspiring beacon for other youth interested in entrepreneurship. The decision was not easy, however, given the talented pool of finalists. 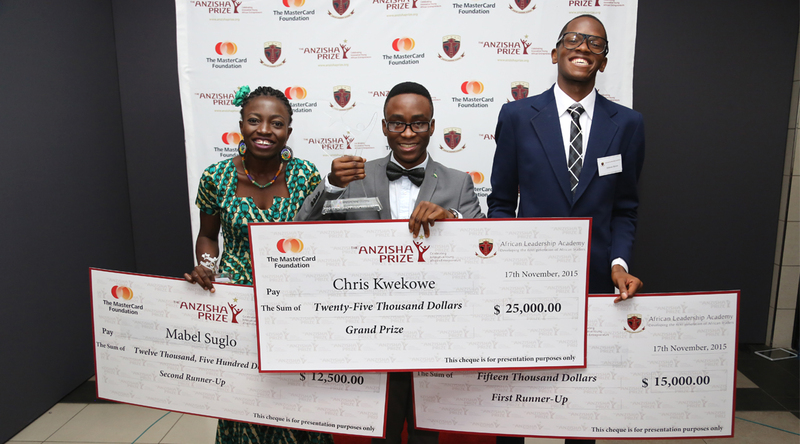 Fintech entrepreneur Fabrice Alomo (22, Cameroon) was 1st Runner Up ($15,000) and fashion entrepreneur Mabel Suglo (22, Ghana) was 2nd Runner Up ($12,500). 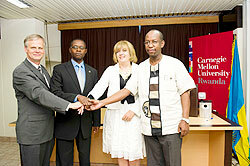 The first runner up was Fabrice Alomo from Cameroon, founder of My AConnect. The venture aims to increase the ease with which unbanked people in Cameroon transact and gain access to financial services. My AConnect provides AMoney, and electronic currency with which unbanked individuals can make purchases with over 500 enterprises by depositing money through charge cards. Fabrice’s vision is to increase financial service access for Cameroon’s 17 million unbanked people. A still impressive second runner up was Mabel Suglo from Ghana, founder of Eco Shoes. Mabel offers an assortment of shoes and accessories that are fashionable and Afro-themed, using recycled materials. Her employee-base is predominantly disabled individuals. She aims to increase their economic participation through job opportunities. Mabel believes that disability is not inability and employs people with a variety of disabilities to create products that she sells into wholesale and retail markets. The Anzisha Sector Prize in Agriculture was awarded to Chantal Butare, founder of Kinazi Dairy Cooperative. Chantal’s cooperative collects milk from over 3,000 families in her community, and processes the milk for sale. She generates income for these families, as well as for ten milk collectors who are in her employ. Her ambition is motivate for sufficient capital to mechanize her process and increase scale to create revenue for yet more families in her community. Chantal is a shining example of youth role models that Anzisha Prize aims to celebrate: Youth who are operating successfully in sectors that are considered non-traditional for youth, but that have immense potential to catalyze economic growth in Africa. “Over the past five years, we have seen the Anzisha Prize evolve from a one-time prize for social entrepreneurship, to an entire community of young, innovative leaders across Africa who have access to comprehensive support and networking opportunities,” says Koffi Assouan, Program Manager, Youth Livelihoods at The MasterCard Foundation. The Anzisha Prize is a partnership between African Leadership Academy and The MasterCard Foundation. The 12 finalists for Anzisha Prize for 2015 were selected from an impressive initial pool of 494 young entrepreneurs, up from 339 applications in 2014. The Anzisha Prize is proud to have attracted applicants from 33 African countries, with finalists from Zimbabwe and Ethiopia identified for the first time this year. Applications were also received from a diversity of sectors, with agriculture having the most applicants. Now in its fifth year, The Anzisha Prize celebrated these outstanding young people during Global Entrepreneurship Week joining the worldwide festivities. Having received a share of US$75,000, the Anzisha Finalists join a growing pool of now 54 Fellows to receive access to ongoing support to scale their enterprises and expand their impact.